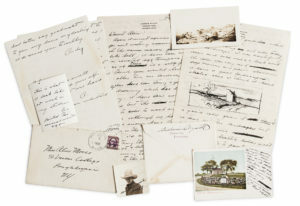 Skinner to Host Books & Manuscripts Online Auction, May 23 – June 2 | Skinner Inc.
MARLBOROUGH, MA – An archive of forty-three unpublished love letters written by secretive and celebrated artist Andrew Wyeth highlights Skinner’s spring auction of Books & Manuscripts. The online-only auction features 592 lots of historical and literary documents, fine and rare books, prints, and maps. Lots open for bidding on Tuesday, May 23 at 12PM and begin closing on Friday, June 2 at 10AM. The letters (Lot 1106, Estimated between $80,000-120,000) are addressed to Alice Moore, between August 1937 and March 1939, documenting Wyeth’s earliest known romantic relationship. Wyeth’s emergence as a prominent force in the art world was also unfolding, with his first exhibition at the Macbeth gallery in New York (fall of 1937), to his invitation to exhibit at the 1939 Carnegie International. The love affair is characterized in the archive by Wyeth’s great yearning for Moore’s companionship and his strong desire to marry her. The letters also indicate his preoccupation with proving he can become a successful artist. Basic information gleaned from the letters is at odds with Wyeth’s biographical record. In Richard Meryman’s book, Andrew Wyeth, a Secret Life, Alice Moore makes a brief if altered appearance. She is described as ten years older than a 17-year-old Wyeth, whereas she was only three or four years older. The relationship was purported to have been kept a secret from the Wyeth family, although Moore visited the family in Maine and Pennsylvania on several occasions, as evidenced by letters in the archive to Moore from Wyeth’s mother and sister, Carolyn. Meryman states that Wyeth broke off the relationship with Moore when she suggested marriage, which, based on Wyeth’s own words in dozens of letters, is patently untrue. Also available in the auction is a first edition of Dr. William Beaumont’s work, Experiments and Observations on the Gastric Juice, and the Physiology of Digestion, 1833 (Lot 1148, $500-700). Prior to the early 19th century, inaccessibility to a functioning stomach within a living subject limited our understanding of the process of digestion. In 1822 Dr. William Beaumont, a US Army surgeon, tended to Alexis St. Martin, who suffered a gunshot wound to the stomach. St. Martin was expected to die, however, his wound healed with an anomaly that allowed direct access to his stomach. Dr. Beaumont was able to carry out hundreds of experiments, which led to the important discovery that digestion was a chemical process and not mechanical. 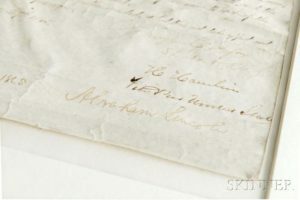 Significant autographic offerings include a manuscript document signed by Abraham Lincoln on February 27, 1865, granting pensions to five revolutionary war veterans (Lot 1058, $60,000-80,000), and an 1802 military commission signed by Thomas Jefferson appointing Pearson Titcomb First Lieutenant in the Regiment of Artillerists, countersigned by Secretary of War Henry Dearborn (Lot 1054, $4,000-6,000). All lots offered at Skinner are available to view online or in person, with specialists available to answer questions. Public previews will be held at Skinner’s Marlborough, MA gallery, on Tuesday, May 30 from 12PM to 5PM and Wednesday, May 31 from 10 AM to 7 PM. The online catalog displays the current bid, asking bid, and time remaining in the auction, in addition to detailed images and condition information. Place a bid for the next bidding increment or place a maximum proxy bid. The system will automatically bid competitively up to that price. Experts are available throughout the auction to answer questions and provide additional information about the lots offered. Skinner auctions draw international interest from buyers and consignors alike, with material regularly achieving record prices. The company’s auction and appraisal services focus on fine art, jewelry, furniture, and decorative arts from around the globe, as well as wine, fine musical instruments, rare books, Asian art, clocks, Judaica, and more. Monthly Skinner Discovery auctions feature a breadth of estate material. Widely regarded as one of the most trusted names in the business, Skinner appraisers have appeared on the PBS-TV series, Antiques Roadshow, since the show’s inception. 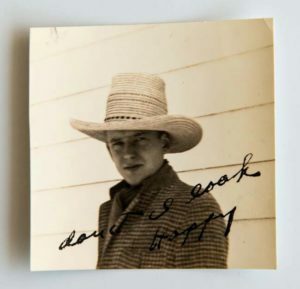 Skinner has galleries in Boston and Marlborough, Massachusetts, as well as in New York City and Miami, Florida, with bidders participating in person, by phone, and online. For more information and to read our blog, visit the website at www.skinnerinc.com, find us on Facebook, or follow us on Twitter and Instagram. This entry was posted in News and tagged Albert Einstein, American documents, american history, Andrew Wyeth, audubon, books auction, boston auction, Charles Dickens, George Washington, John F. Kennedy, literary history, love letters, presidential documents, rare books, rare manuscripts, Theodore Roosevelt by Skinner. Bookmark the permalink.